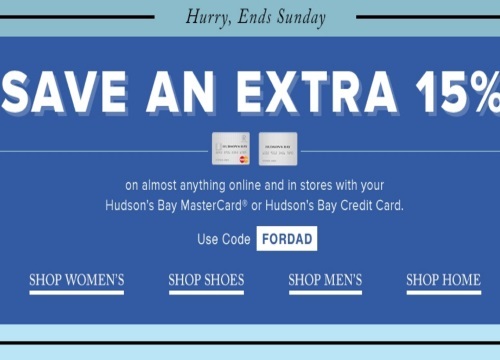 Hudson's Bay is offering an extra 15% off for Father's Day shopping! Save an extra 15% off almost anything online and in-store when you pay using your Hudson's Bay Mastercard or Hudson's Bay Credit Card with the promo code below. Enter the promo code FORDAD at checkout. Offer is valid until Sunday, June 5, 2016.